Christine’s belief is that angels are Divine aspects of God that He created to help us through our life's journey. She believes that each person has their own set of angels to guide, protect, and intercede. 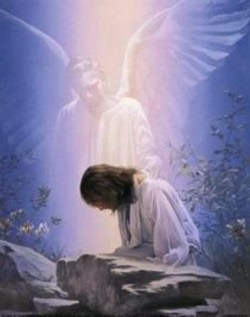 Angels are messengers of God who surround us and wait to be invited to help unless otherwise guided. Additional angels and guides come in and out of our lives depending on our changing needs. However, a core group stays with us from birth through transition. Growing up Catholic, angels were everywhere and have always been a part of Christine’s life. Throughout her childhood, angels were illuminated from the beautiful stain glass windows lining her church, depicted throughout the pages of Bible stories, and passed on through faith and prayer from her family. She held no doubt angels existed. So it wasn’t a big leap of faith when she began to understand what she was experiencing when the angels communicated and began to appear to her in full form. Along with her extensive knowledge and training in her field, Christine also invites your angels to be part of the session, whether it is a wellness consultation, energetic healing, mediumship or an angel reading. Angels bring wonderful perspective and information that cannot be found in books and education alone. Prior to your an angel reading it is beneficial to spend time being mindful. Write down the questions you would like to ask. The more specific the better. Set your intention and stay open to what God has for you. There may be questions asked based on the information she receives. It is important to remember that an angel reading is not a prediction of the future. Based on where you are and what you are doing Angels guide you to choices that are in your highest good. Remember God has given us all the gift of free will, making us participants in the journey. Our thoughts and actions can change the course at any given time. If you forget a question or two, no worries, your angels have your back and they will deliver exactly what is most important for you to know with a great love and compassion that only God can give.